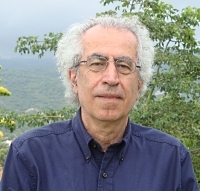 Prof. Amir Hasanpour, Kurdish Times NY, 1991. Soon after the formation of the Syrian state, under French mandate (1920-46), Kurds demanded self-rule within the borders of the country. A petition addressed to the constituent assembly of Syria on June 23, 1928 included the following demands: 1. The use of the Kurdish language, in the Kurdish regions, concurrently with other official languages; 2. Soon after the formation of the Syrian state, under French mandate (1920-46), Kurds demanded self-rule within the borders of the country. A petition addressed to the constituent assembly of Syria on June 23, 1928 included the following demands: 1. The use of the Kurdish language, in the Kurdish regions, concurrently with other official languages; 2. 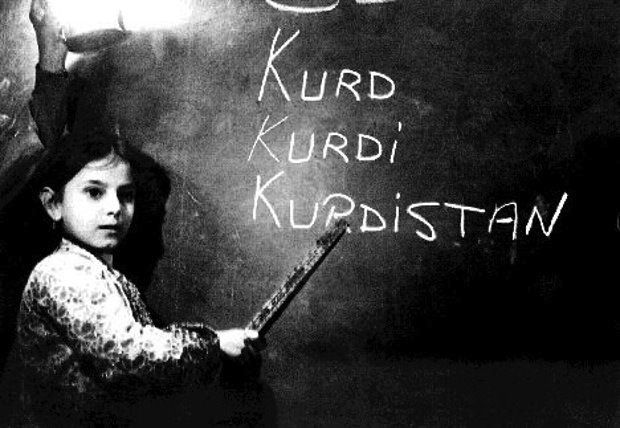 Education in the Kurdish language in these regions; 3. 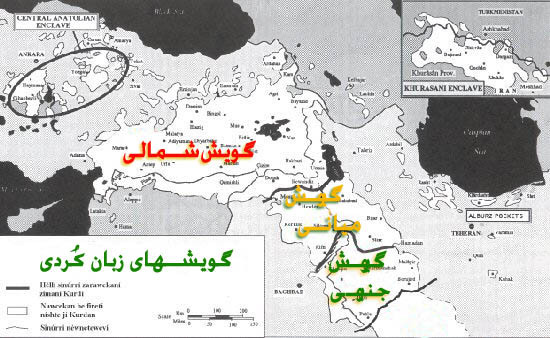 Replacing government employees of these regions by Kurds (Rondot 1939: 105f). The Mandate authorities did not favour self-rule in this part of Syria. One reason was Turkish and Iraqi intolerance of an “autonomous Kurdish territory” on their frontiers (Ibid, p. 106). According to one of the Mandate officials, Rondot, the use of the Kurdish language was free, without being official, in the region. Yet the absence of school material in the language and the absence of popular demand had made the organisation of education difficult, according to Rondot (ibid., p. 107). According to Zaza (1928:81), however, the Mandate’s refusal to permit mother tongue education was for political considerations. When a young Kurdish writer, Mustafa Boti, asked for authorisation to open a school with Kurdish as medium of instruction, the Mandate authorities refused to grant him permission. They said that France’s commitment to Middle-Eastern states prevented her from getting involved in such “adventure”. Publishing in Kurdish was, however, permitted and a circle of local intellectuals and former political activists from Turkey, eg., Bedir Khan brothers (see Nikitine 1960), began their linguistic and literary work in the Kurmanji dialect, written in the Roman alphabet, in Damascus in 1932. Their major effort was centred on the publication of a journal, Hawar. According to Zaza, who was involved in the Damascus circle, the Mandate authorities banned the journal in 1937, after Kurds supported had the struggle of Syrian nationalists for independence (ibid., p. 85). The journal was permitted to reappear four years later, during World War 11, after the arrival of the British in Syria (ibid., p. 245, Note 40). In Syria, as in Iraq, Kurds enjoyed more freedom to use their language in writing and broadcasting, during World War II years when Kurdistan had become strategically important. The Badir Khan brothers published three journals one of which, Ronaha. was almost entirely devoted to war propaganda. Broadcasts from Radio-Levant continued from 1941 to April 1, 1946. During the period between the end of the Mandate (1946) and the union of Syria and Egypt in the United Arab Republic (1958), tolerance of publishing in Kurdish continued, though the journals disappeared. The Kurdish Democratic Party of Syria founded in 1957, called for the recognition of Kurdish national rights. The United Arab Republic suppressed the party, and possession of Kurdish publications and even gramophone records were enough to send their owners to prison (McDowall 1958:76). The collapse of the union with Egypt in 1961 brought even more pressure when a special census taken in the Kurdish province of Jazira (November 1962) discounted some 120,000 Kurds as “foreigners”, though they were in possession of Syrian identity cards. The government began to build an “Arab Belt” aimed at Arabizing the Kurdish regions. When the Ba’ath Party came to power in 1963, the plan was continued under the slogan of “saving the Arabism of Jazira” (Vanly 1968a: 1968b). To implement this plan, the Baath regime built an ‘Arab Belt’ 10-15 km deep along the Kurdish border resulting in the expulsion of thousands who were replaced by Arabs settled in ‘model farms’. Moreover, the government refused to implement land reform in areas where its application would have given land to Kurdish peasants. The Arabization plan led to the evacuation of no less than 60,000 (120,000 according to some estimates) Kurds who moved to non-Kurdish areas or to Lebanon. The Arabization plan through population transfer was temporarily abandoned after the breach between the ruling Baath parties of Baghdad and Damascus in 1966. One point of disagreement between the two regimes was Syria’s opposition to the Iraqi government’s overtures to the Kurdish autonomists for a negotiated settlement of the conflict. Syria had sent thousands of its armed forces to Iraq to help Baghdad in suppressing the autonomist movement in 1963, and was strongly opposed to any concessions to Kurdish nationalism. In 1976, President Hafiz Asad officially renounced the further implementation of the ‘Arab Belt’ project and decided to “leave things as they are” (Nazdar 1980:218). Arabs already moved into predominantly Kurdish areas were allowed to stay, however (McDowall 1985:26). The “tolerance policy” is to a great extent dictated by pragmatic political considerations rather than a change in belief or attitudes of the ruling party. Damascus had been involved, since the mid-1970s, in a bitter war to overthrow the rival Baath party in Iraq and to achieve this end it has given extensive assistance to all political organisations that oppose Baghdad. The Iraqi Kurds received more assistance because they were the only group that offered effective armed resistance to Baghdad. Another factor was Syria’ use of the Kurds as in trump card in settling her dispute with Turkey. *One may conclude, on the strength of the evidence presented thus far, that Syria’s policy on the Kurdish language has been, like that of Turkey, one of “linguicide”. The relatively smaller number and proportion of the Kurdish population in the country together with territorial discontinuity of the Kurdish regions facilitate the regime’s de-ethnicization program. *In the mid-1980s, the Turkish press was accusing Syria of supporting the Kurdish “separatists” of Turkey. By this time, Syria had further relieved pressure on the Kurds, who were allowed to celebrate their national New Year (Newroz) feast everywhere, including in Damascus. According to a statement by the Federation Internationale des Droits de l’Homme dated April 29, 1986 (reprinted in ‘Information and Liaison Bulletin’ of Institute Kurde de Paris, No. 18, May 1986, pp. 14-15), the government prevented the celebration in 1986, and troops killed 10 protesters and wounded and arrested hundreds in the Kurdish regions and in the capital. According to the statement, the action was a result of agreements reached between Syria and Turkey.